There’s some clear effort put into this one, heavily visual with some fun artistic touches. Many infographics are just heavily glorified fact lists, and while this isn’t really an exception, there’s a nice variety of kind of fact to keep a person reasonably entertained. The timing is good, of course, and appropriate to get people into the mood for the upcoming Oscars. An effort was clearly put in to have the visuals support the content. Unfortunately, the information wasn’t very easily helped by the images. From a visual information standpoint, for example, saying the statuette weighs the same as 250 DVDs (presumably DVDs being film-ish so appropriate for comparison…) and then showing 56 DVDs in the picture doesn’t exactly do what a truly useful infographic is meant to do. From a visual presentation layout standpoint, the infographic was fun, but a bit busy, chaotic, and over-flashy. Not terrible, but not really helpful either. Stylistically, it is somewhat reminiscent of TheOatmeal, so if you like his style, and you care whatsoever about the Oscars, you might like it. Concerning the facts themselves, I found that the opening fact wasn’t very interesting, deadly for a narrow scroll-down-to-read-fit-for-blogs infographic. 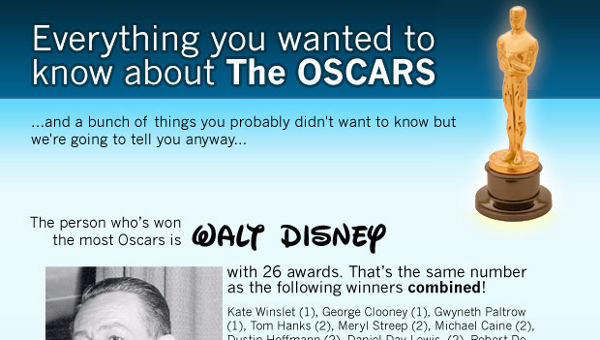 It compared Walt Disney’s whopping 26 Oscars with the combined totals of many well-known actors. While I see the point being made, the fact is that Disney didn’t get his Oscars for acting. Given the wide range of cinematic fields in which you can get an Oscar, you’re comparing apples and oranges. If someone got 15 Academy Awards for best make up, would we really liken them to the combined acting prowess of a dozen of Hollywood’s best actors? Also, 15 facts is, I would say, enough for a list-driven infographic, but any less would have started to seem short. This entry was posted on March 1, 2010, 9:23 pm and is filed under Entertainment. You can follow any responses to this entry through RSS 2.0. You can leave a response, or trackback from your own site. Thanks for reviewing the infographic. It was our first attempt at putting something like this together so nice to get some feedback on what worked and what we could do better if we do another one.